Ernest Hemingway described Kobarid as “a little white town with a campanile in a valley”. The small village is now home to the Kobarid Museum, the Italian Mausoleum, and several surrounding area hikes including those mentioned below as well as the long Walk of Peace journey and the short Great Kozjak Waterfall hike. When visiting Kobarid, be sure to stay at Hiša Franko and enjoy a six-course meal cooked by the number one female chef in the world in 2017, Ana Roš. Hiša Franko was once a roadside inn, a village mill, a countryside estate, and a hospital in World War I where it is rumored Ernest Hemingway was treated for injuries during the war after his ambulance was hit by a mortar shell. Now it operates as a hotel and restaurant, though Ana and Valtar like to call it their home. Valtar handles their wine and cheese cellar while Ana handles the kitchen. We stayed the evening and were treated to a tour of their wine and cheese cellar where Valtar talked about the cheese he makes, the wines he selects and the time they together spend pairing the wine with the restaurant menu. We tasted a sparkling wine with cheese lollipops which were spectacular! Ana uses many local ingredients for the dishes served at her restaurant including vegetables and herbs from her garden and trout from her fish ponds. We enjoyed a lovely meal while visiting which included an amuse-bouche, amazing bread (cooked with fermented apple peels rather than yeast for rising) with tarragon salted butter, a divine salad drizzled with pumpkin oil and top with pork cracklings, goat cheese ravioli with corn and hazelnuts, trout with beets and watercress, potato polenta topped with octopus cooked in lamb fat, tender venison garnished with spruce and wild mushrooms, rhubarb with knotweed, and another amuse-bouche at the end. Decadent! The flavors were very unique and interesting. For example, a bite of the rhubarb without a piece of the knotweed tasted completely different than if a slice of the knotweed were added. It was best to eat carefully and make sure all the flavors were included with each bite. The service was excellent as the wait staff described every dish and taste of wine in detail. We were provided stools next to our seats for purses, phones and other belongings. The elegant restaurant included both indoor and outdoor seating and exuded a wonderful ambience. The hotel rooms, modernly decorated, seemed to be recently refurbished. The bathroom, furniture, and decorations were very nice, though I believe there was more attention given to interior decorating rather than functionality. The electrical outlets were few and far between. I plugged the cord for the hairdryer into the outlet closest to the sink and couldn’t even reach the tiny mirror that spun around as the standing fan circulated cool air about the room. We only stayed one night, so it wasn’t a big deal, just a slight surprise based on how new the room appeared. Before we left the following day, we enjoyed an elaborate buffet breakfast with a selection of cheeses, fruit, berries, cereals, breads, yoghurt and eggs cooked to order. Then we toured the lovely garden! Those who aren’t history buffs may wonder why the small Town of Kobarid (population just over 1,000) would be home to a small, but excellent World War I Museum. It is because Kobarid, Slovenia also known as Caporetto, Italy located in the Soča River Valley saw some of the fiercest fighting in World War I. Ernest Hemingway, who drove an Italian ambulance on the Eastern Front, wrote about the battles here in his book A Farewell to Arms. While the Western Front gets more attention, the eastern border battles were just as important. In a series of 12 battles on the 60-mile-long Soča (Isonzo), 300,000 soldiers died, 700,000 were wounded, and 100,000 were declared MIA. In addition, many civilians died too. Nine months into the fighting, Italy decided to join the Allies in WWI on April 26, 1915. Within a month, it declared war on the Austro-Hungarian Empire which included present day Slovenia. Italy invaded the Soča River Valley and took Kobarid which it planned to use as a base for deeper attacks. The next few years included ten more battles. Italians, who outnumbered their opponents 3-1, unsuccessfully attacked the Austro-Hungarian army who held higher ground during a brutal winter. Soldiers froze to death and were killed by avalanches. The war became one of attrition. By the fall of 1917, the Austro-Hungarian Empire along with its German Allies decided to ramp up its forces and retake the Kobarid and the Soča River Valley which at the time was the natural route from Italy to Vienna and Budapest. On October 24, 1917 during the 12th and final battle, they sent 600,000 troops into Kobarid and utilized what is now known at the Blitzkrieg technique which is common today to take over the city. German commanders were empowered to make their own decisions rather than to wait for approval from higher officers, so they were able to quickly breakdown three lines of the Italian’s defense. The Italians call this Battle of Caporetto their Alamo. With the German’s providing so many soldiers to the Eastern Front, the Western Front weakened and a year later with the aid of the USA, Britain and France, Italy was able to retake the Soča River Valley easily. On the top floor of the museum, a model traces the Blitzkrieg attack with red and blue lights that represent the opposing armies moving in and retreating out of the Soča River Valley. There is also a wonderful 20 minute film that plays in different languages and several artifacts and letters from soldiers who fought in the war. The museum’s exhibits with English description present the facts and the fighting without getting into “good guys” and “bad guys”. I’m not a history aficionado, so I learned quite a bit about World War I and really enjoyed it. In the Town of Trenta, there is a Triglav National Park Information Center. From this Center follow the Soča Pot (Trail) for a hike through this beautiful area once fraught with war. Stasa, our guide led us across the street, to the trailhead and through the woods by the Soča River. The trail gradually left the river’s edge as it climbed through the woods dotted with wildflowers to views of Mount Triglav, Slovenia’s tallest mountain. The wildflowers, old footbridges, spectacular mountain views and aqua waters of the Soča River provided for a lovely walk on this five-mile section of the trail. While we waited for the vans to pick us up we soaked our feet in the ice cold water! After the hike, try a local meal at Tourist Farm Jelinčič, Jelink Camp and Sirarna. We had cheese, bread, sauerkraut soup, dessert, and the local beer. The patio offers lovely views of the towering mountains above! On the border of Italy and Slovenia is a mountain named Matajur. We began our trek to the top at Il Rifugio Pelizzo. The dirt path follows a gradual incline through a hillside of wildflowers. There were so many varieties of wildflowers, I spent much of my time at the back of the pack snapping photos. Occasionally, I looked up to admire the surrounding views which on a clear day reach to the Adriatic Sea, the Julian Alps, and the Dolomites. 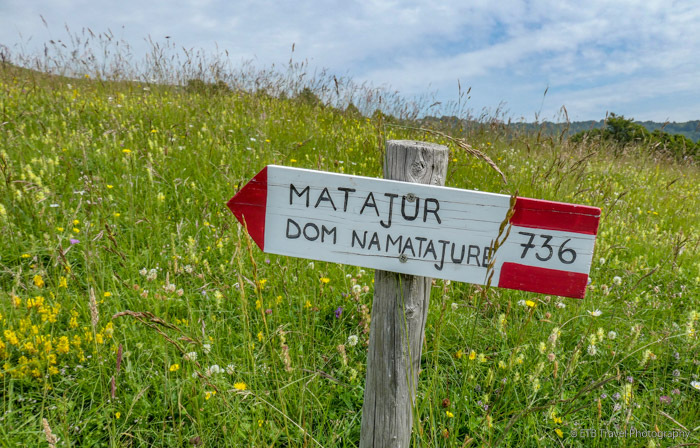 We followed the well-marked trail with red and white signs past a few huts as we kept climbing to the summit topped with a church, a memorial, and border posts. While the sky was relatively clear as we began the climb, by the time we reached the peak, clouds enveloped the area. Though our views diminished to almost zero visibility, the pure gray sky was kind of cool. After straddling the Italy/Slovenia border, we headed part way down the mountain for a homemade meal that Domen packed up the mountain for us. Sometimes, it’s really nice to pay for the “glamping” hiking tours, and leave all the hard stuff for the guides. Cividale del Friuli, Italy is only about 30 minutes away from Kobarid, Slovenia. The border crossing on a weekday didn’t take long. Cividale Del Friuli has a cathedral, a nice main street lined with shops, and a lovely square surrounded by cafes and tasty gelato shops. Wander along the cobblestone streets and enjoy this quaint village. Ceglo, Slovenia is less than one hour away for Kobarid and is home to Gredič Castle. The Castle operates a hotel, restaurant, and Vinothèque. We actually stayed here for a night and enjoyed fantastic views of the vineyard dotted hills, a tasty dinner, and a fun wine tasting. We stayed at the Castle as it made for a shorter drive to Venice the next day, but it can easily be visited for a half-day wine tasting event. The wineries of this area are small and don’t make mass product to ship around the world. As such, it’s best to drink up while visiting and perhaps purchase a few favorites for the plane ride home. A spiral staircase dramatically descends down to an enormous open area where we tasted wines at the bar after taking a look through their wine cellar. It was quite a nice experience before we sat for a lovely dinner. The hotel is home to seven rooms, so our group took up all three floors. Page and I were the lucky pair that ended up with the penthouse suite complete with a living room, dining room, kitchen, two baths and two bedrooms. The tub in my bedroom was rather unique, especially since there wasn’t a faucet, but it provided nice views! Beth you are so gifted & have an amazing eye. You completely captured what I experienced, while traveling to these places! Thank you Mary. Glad you enjoy the blog! Amazing posts. Loved reading about this part of your trip! Sounds like it was a fabulous visit! Thanks for the tips!